The treaty uniting Russia, Belarus and Kazakhstan in the new organization Eurasian Economic Union (EaEU) will create a common market for 171 million people. Armenia, Kyrgyzstan, Tajikistan and Uzbekistan have also expressed interest in joining. That would bring it to a total of 217 million. There’s lots of talk in the EU and the US that this is Putin’s answer to the crisis in Ukraine, another proof of his devious lust for power, of his desire for a new Soviet style empire. His annexation of Crimea has shown to the world what a dangerous despot he is. This EaEU is his next step. We’d better be prepared to stop him in his tracks, right now. Is this indeed Putin’s answer to the EU? Talk about a ‘leading’ question. There is so much wrong in framing the matter like this that I would not know where to start within the boundaries of this one article. I’ll stick to some brief remarks. Why does everything in the world have to be an ‘answer’ to the EU, the US or its allies? Eurocentrism and American ‘hubris’ (the extension of former colonial European hubris) is one of many reasons why western media frame the matter this way. The idea that other countries, regions, economies might have their own agenda, their own interests, their own vision on the world independent from ‘us’ is unfathomable for most Europeans. It just cannot be. Seriously, Russia has a lot of reasons to do what it does, dealing with the EU is just one of them. There is also an elephant in the room that one is not supposed to see, let alone mention. It’s racism. Anti-Russian racism in the EU and the US in recent months is nothing new. Whatever one may think of the extinct Soviet Union, it was not its lack of democracy or freedom that caused western hostility. Just look at the long list of dictatorships supported by the West during (and after) the Cold War. The Cold War was a standoff between different economic systems. Europe, the ‘First World’, has never forgiven Russia for stepping out of its traditional role of a subservient Third World country. A few weeks back, I heard a self-declared expert on Russia declare that Ukraine is ‘the battlefield of civilisation against barbarism from the East’. Most European analysts wouldn’t put it in such crass terms. It does however come down to this. How dare ‘the Russians’ think they have a say in things? Don’t they know that we own the world, their part of it included? Putting prejudice aside, the EaEU is indeed an answer to the EU, as it is an answer to many other things. Any initiative like this, be it the EU itself, the OAS, the UN, NAFTA, was ‘an answer’ to something, to the problems and challenges that countries faced at a certain moment in their history. Why would sovereign nations not have this right to forge economic cooperation in the manner that they see fit? And why would such an initiative by definition be hostile to other similar initiatives? The EaEU might just as well be taken as proof of the good example of the EU. No single initiative like this has ever come to be on the spur of the moment, as an immediate reaction to pressing political crises. The idea for the EaEU goes back to 1994, 20 years ago, when Russia was considered a mostly harmless and defeated ally. The idea was never opposed by the EU at the time (not openly at least). It took years to prepare and will probably take many more to have a real and lasting impact. There are of course some critical remarks to be made here. Unlike the EU, the EaEU is not a gathering of countries of similar size and power. In its present form, Russia stands for 85 per cent of its population. However, both the presidents of Kazakhstan and Belarus have proven to be tough negotiators and Belarus recently stated it does not see membership as an impediment for good economic relations with the West. This deal was negotiated, not enforced. Granted, the EaEU is not exactly a beacon of democracy. Neither is the EU. The EU is democratic only in that it united already performing democracies. By and of itself, the EU is not democratic, its parliament has no power, the European Commission is not an elected body and the EU is forcing member state governments, left and right, to the same neoliberal austerity programs, against the will of its own population. The EU did not eliminate elections; it made them irrelevant, without any impact on real policy. Besides, things need to be put in perspective: if successful, the EaEU would unite up to 217 million people. Put that next to the 506 million citizens of the EU, with a far superior GNP per capita. Since its founding year 1957, the EU expanded from 6 to 27 member states. Five of these states are former East Bloc and Warsaw Pact members; three others are former Soviet Republics. 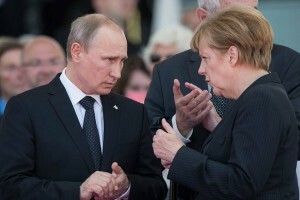 Russia coming up with ‘an answer’ to the EU is hardly expansionism, it is common sense. Meanwhile, it is too soon to establish the true potential of the recent multi billion dollar gas deal with China. Deals like this are made for a complex set of reasons, economic profit being an important one, but other geopolitical motives are always at play. This deal with China is among other things an answer to the Ukrainian crisis, to the strained relations with the EU and to foreseeable future problems with gas deliveries to the EU. Russia will use this deal as a bargaining chip. This strategy is no different from the way the EU and the US have negotiated similar deals all around the world. Did attempts to isolate Putin and economic sanctions work? Like the first question of this article, this is a leading question. If you take ‘isolation’ strictly in its ideological sense as ‘isolation by the western powers’, it’s not coherent. If you take ‘isolation’ in its dictionary meaning, it is pure nonsense. Russia is hardly isolated by the real world. The rest of the world outside the EU and the US begs to differ on the matter and differ they do. The next BRICS-summit in July will be an occasion for Russia to defend its position on the Ukrainian problem and forge new economic ties with likeminded allies. The EaEU is among many other things an answer to the EU, a perfectly legitimate one. The EU and the US may not like it, that is their right, but the days in which everything in the world was their ‘business’ are over. Will the EaEu succeed? Hard to tell, it does have potential. An American! Where my Government and leader are criminals!! Russia is protecting its national interests and Putin is playing a good game. Hard and near impossible for him to deal with the perfidious Washington degenerates. Maybe the Europeans will grown some balls and realise they are being played by Washington. After all their economic and energy ties with Russia are far greater then those with the declining US. I´m so totally fed up to this attidude against Russia. You know, in Finland this kind of arguments were used to justify Swedish dominance over us, more than hundred yers ago. And this spirit is still here. And usually those hypocrites speak loudly about “human rights”, “democracy”, “freedom”, and so on. Nothing has changed. BTW, I feel that Russians, in general, are more civilized than we western slaves of neoliberalism.